Description: FIVE different sets. 66 cards all together! Living Room: armchair, couch, ottoman, rocking chair, lamp, fireplace, television, plant, coffee table, bookshelf, rug, grandfather clock, painting, picture frame, stereo, and mantel clock. Description: There are 12 cards with words written on them and the same 12 cards without the words. There are also two full-page pictures. These flashcards can be used with the CUT 'N PASTE - The Seasons worksheet in the FREE Worksheets section. The theme can be "My favorite season..." and can involve pair/group work. From instructions on cards, "A minimal pair is a set of two words that are only differentiated by one tiny sound. 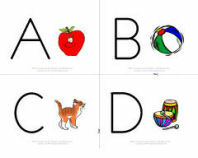 If learners can distinguish these tiny sounds, it will help them with pronunciation and comprehension." Description: Full color, bright, 4 per page flashcards. Picture and word. Carrots, potatoes, cabbage, tomatoes, cucumber, onion, garlic, lettuce, leeks, eggplant, peppers, mushrooms, broccoli, beans, peas, celery, asparagus, spinach, green beans, and pumpkin. Description: THREE different sets. 60 cards all together! Full color, bright, 4 per page flashcards. Picture and word. Bathroom: shower, sink, towels, bathtub, toothbrush, toilet, rubber duck, soap, toothpaste, hairbrush, mirror, and shampoo. Bedroom: toy box, rug, side table, bed, dresser, teddy bear, alarm clock, pillow, lamp, wardrobe, pyjamas, and blankets. Kitchen: stove, fridge, freezer, cupboard, knife, fork, spoon, bowl, plate, cup, mug, glass, pots, pan, frying pan, sink, trash can, microwave oven, toaster, jug, blender, juicer, ladle, colander, grater, beater, kettle, dishwasher, coffee maker, hand blender, cutting board, pitcher, scale, corkscrew, dishcloth, and cake pan. Description: 32 Cards! Full color, bright, 4 per page flashcards. Picture and word. Animals: lion, giraffe, elephant, rhinoceros, hippopotamus, panther, cheetah, zebra, pelican, snake, lizar, ostrich, bear, penguin, moose, deer, goose, swan, mouse, monkey, flamingo, owl, coyote, fox, piranha, salmon, whale, shark, dolphin, seal, eagle, and hawk. Description: THREE different sets. 36 cards! 32 Cards! Full color, outline in color, outline in black, 4 per page flashcards. Picture and word. Shapes: square, rectangle, circle, oval, trapezoid, diamond, hexagon, pentagon, cross, triangle, star, and heart. Regular: Full color, ready to print. Ink Saver: Only the outline is in color to save on ink when printing. Color Yourself: Color or paint after printing. Students can also color. Leave as is for simple cards. Description: 16 color cards with names written under picture -- cow, pig, horse, dog, sheep, goat, duck, goose, donkey, hen, rooster, cat, chicks, duckling, turkey, and bull. Description: Large colorful flash cards with clothing vocabulary. Includes apron, blouse, belt, bathrobe, boots, dress, hat, coat, gloves, mittens, poncho, pants, shirt, raincoat, scarf, shawl, sneakers, shoes, skirt, shorts, tie, T-shirt, socks, and vest. Description: FIVE different sets! 224 cards! Description: Deliciously bright flash cards with fruit vocabulary. Fruits: bananas, pear, apple, watermelon, grapes, mango, cherries, strawberry, orange, lemon, lime, peach, kiwi, raspberries, pineapple, avocado, plums, fig, melon, and blueberries. Description: THREE different sets. 52 cards! Regular numbers 1-20. Numbers 1-12 with a corresponding number of stars on each card. Numbers 1-20 with written numbers on the card. Written numbers one to twenty. These can be used for many activities, tasks, and games. Description: FUN family vocabulary flashcards. Includes mother, father, grandmother, grandfather, sister, brother, big sister, big brother, baby, aunt, uncle, and full family cards. Description: TEN different sets!! 260 cards all together! Be creative! There are hundreds of game and activity opportunities with these flashcards. Description: Eight full sized cards. Easter eggs, Easter bunny, Easter chick, Easter lily, chocolate bunny, chocolate egg, Easter hats, Easter cake. corn, cornucopia, cranberry sauce, Thanksgiving dinner, history, first people, two cultures, November, Pilgrims, pumpkin pie, The Mayflower, turkey. Description: Scarrrrry... bats, ghost, spiders, Jack O'Lantern, witch, Dracula, black cat, and skull. Description: Ho! Ho! Ho! Santa, reindeer, ornament, angel, tree, wreath, stockings, gift, bells, sleigh, candle, gingerbread house, candy cane, gingerbread man, carollers, and holly. With and without captions. Regular and bigger size. Description: 25 wee little leprechaun-sized flashcards. A fun alternative to regular flash cards. The children will enjoy crowding together at the front of the classroom to see the tiny flashcards. Description: Four full sized cards. Clover, leprechaun, horse shoe, and pot of gold.